Striving to Abide in Christ: We will soon be adding one!! We will soon be adding one!! Hello everyone! This is for anyone who may not know yet, we are expecting a baby! This will be our 6th blessing from the Lord and we are very excited! Paige is sure that it is a girl! She had been praying for another baby (girl) and a few weeks ago she stopped praying. When I asked her why she said because there is a baby in there! Wow, she knew before I did! So far I am having a great pregnancy (it's very early still!) with NO morning sickness. Last time I was in bed for 2 months with severe sickness. So this is a blessing! I am just tired which is to be expected. The children and Troy are helping out and letting me get some rest when I need it. I'm very thankful! We think the due guess is March 12th! It's so fun to hear this wonderful news in print, this time! :) I'm thrilled for you guys; what a joyous time! Take good care of yourself. Praise the Lord for blessing you guys. CONGRATULATIONS! PRAISE THE LORD! HOW EXCITING!! That is so neat how the Lord gave Paige that knowledge before you even knew! I have heard of that happening before, but just things it is a testament to His power, and love to us when he reveals things to young children! I love Paige So... MUCH! And sincerly hope she gets her baby sister! Can't wait to meet the little one Lord willing come March! PTL for a healthly pregnancy thus far! May He continue to bless you in that area! 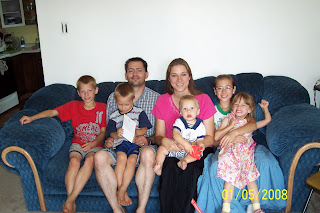 I came across your blog and you have a beautiful family. I love looking at others who want large families too. You are blessed.